With the influx of television revenue taking the amount of money in football to a whole new level, it's no surprise to see transfer records being continually shattered all over the world. Neymar's €222m move from Barcelona to Paris Saint-Germain remains, for now, the biggest transfer ever completed - though that record is unlikely to stand for too much longer with the way things are going. The Brazilian was 25 at the time of his move to Ligue 1 - but what are the transfer records for every age between 16-35? Well never fear, as 90min are here and armed with a statistics black book detailing every blockbuster deal there's ever been. Upon signing for ​Real Madrid in May 2017, the record transfer fee paid for a 16-year-old wasn't the only record that Vinicius Junior broke. He became, at the time, the second most expensive sale of a player in the history of Brazilian football (behind Neymar only), and the most expensive teenager in the history of football. Due to international transfer regulations preventing him from moving sooner, he didn't actually move to Madrid until the summer of 2018. Now he's there though, Vinicius will be determined to prove that he's worth every penny. It's a case of history repeating itself when we move into the 17-year-old category - with Real Madrid again the club involved in spending a whack load of money on a prodigious young talent. Well, that's what we're led to believe in anyway about Santos forward Rodrygo. The Brazilian is widely regarded as one of the most gifted young players in the world - though his skills remain somewhat of a mystery to worldwide audiences owing to the fact that he is still currently playing in Brazil. He'll complete his move to Madrid in the summer of 2019 - where he'll get the opportunity to justify his rather hefty price tag. There was no surprise at all when ​Manchester United, at the time, made Shaw the most expensive teenager in the world when they snapped him up from Southampton in 2014. He'd just enjoyed a whirlwind first season at St Mary's, showing maturity and ability well beyond his years in a truly memorable debut campaign. A horrific leg injury curtailed his progress at United, but having overcome those injury obstacles and an indifferent patch of form, he's slowly but surely repaying the faith put him in by the Old Trafford coaching staff. There are many adjectives you could use to describe Kylian Mbappe, but it's unlikely that any of them will adequately describe his talent. Recognised as one of the finest young players in the world, ​Mbappe has already proven on the biggest stage of them all that he has what it takes to ascend to the top of the game - winning the 2018 World Cup with France en route to being crowned the Best Young Player of the tournament. PSG snapped him up for a phenomenal €135m fee from Ligue 1 rivals Monaco aged just 19, though that is likely to prove a bargain once he's finished concluding his business in Paris. Another player who arrived at his current club for a nine-figure sum is ​Barcelona and France winger Ousmane Dembele. He spent just one season in the Bundesliga with Borussia Dortmund before Barça were persuaded to part with an eye watering €115m to bring him to Camp Nou - a fee that at this stage, he has struggled to justify. Time is on his side though, and Dembele will be keen to show the world that he is capable of mixing it with the elite of world football. Making his first of two appearances on this transfer record extravaganza is current world transfer record holder, ​Neymar. The Brazilian superstar arrived in Camp Nou in 2013, in a remarkably complicated deal that involved money going to Santos, agents and goodness knows who over Neymar's image rights. Once arrived and settled though, he quickly established himself as a member of the feared 'MSN' trio alongside teammates Lionel Messi and Luis Suarez. He set La Liga alight for four seasons, before heading onto pastures new at Paris Saint-Germain in an attempt to step out of Lionel Messi's rather large shadow. Anybody else noticing a bit of a pattern here? If you want big money talent to move for mega bucks, then La Liga is the place to be. And that's exactly where France winger Thomas Lemar ended up last year - when he moved from Monaco to join ​Atletico Madrid for €70m. The then 22-year-old had been linked with the Premier League but when push came to shove, it was Atleti who stumped the cash - though his start in the Spanish capital has been less than convincing. You won't find many footballers around who are able to cause as much controversy as ​Paul Pogba - but that's exactly why he's the kind of player that's worth splashing €105m on. Having moved to Juventus from Manchester United in 2012 on a free transfer, Pogba was soon the centre of the Red Devils' attention again as they perhaps realised that letting the midfield maestro go was a rather epic mistake. A will he, won't he scenario played out for a number of months before it was confirmed that the then 23-year-old Pogba would be returning to United - for a rather large sum of money. You do wonder what Tottenham might have been able to achieve under Mauricio Pochettino had they been able to keep Gareth Bale on the books. The mercurial Welshman had worked wonders in north London for a couple of seasons before rumours began swirling that Real Madrid were interested in taking ​Bale to the Santiago Bernabeu. Spurs fought bravely to keep hold of their talismanic figure, but in the end were forced to cave in to the financial power of Real. A cheque of €101m was signed off and deposited into Spurs' bank account, with Bale becoming the most expensive 24-year-old in history as a result. 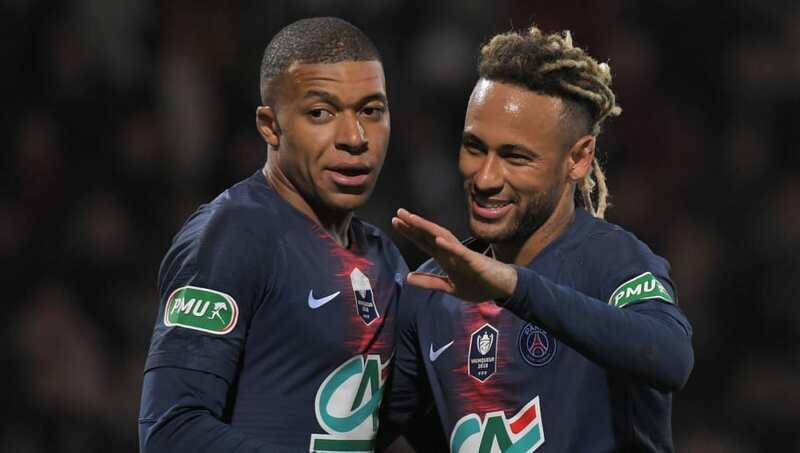 Not content with costing Barcelona €88m four years previously, Neymar was once again the centre of attention when he made the unbelievable decision to ditch La Liga for the riches of Paris Saint-Germain. The now 25-year-old claimed he wanted a fresh challenge away from the Lionel Messi limelight, suggesting that he wanted to prove himself as the best in the world. A staggering €222m was paid to secure his services - making him the most expensive player of all time. Premier League leaders ​Liverpool had been crying out for a colossal central defender for a number of years, having seen defensive frailties cost them time and time again when it really mattered. And that's exactly what they picked up in the form of Virgil van Dijk just as 2017 was drawing to a close. The 26-year-old Dutchman had starred for both Celtic and Southampton for a number of seasons, proving on countless occasion that he was capable of playing at a higher level. His chance finally came when Liverpool went all in and splashed €85m to snare him for Southampton - and they, along with Van Dijk, haven't looked back since. Having agonisingly fallen short in his quest to win the Premier League title with Liverpool, time was up at Anfield for Luis Suarez when Barcelona came calling back in 2014. The Uruguayan striker had been an influential figure in England, netting 69 times in 110 Premier League appearances - 31 of those coming in the aforementioned 13/14 season. Barcelona needed a goalscorer and decided Suarez was the man for them - regardless of his World Cup biting misdemeanours. €82m later and the deal was done - with ​Suarez proving to be worth every last penny for the Catalan giants. Goals, goals, goals. That's what Argentine striker Gonzalo Higuain has provided during highly successful spells in Madrid, Naples and Turin. His goalscoring exploits for Napoli were so impressive in fact that, back in 2016, Serie A rivals Juventus decided to make him the most expensive signing in the league's illustrious history when they agreed to pay €90m to bring him to the Allianz Stadium. Needless to say, his goalscoring ability was a major contributing factor in allowing ​Juventus to continue their streak of Serie A title wins - which now stands at seven. Arguably the most talented midfielder ever to play the game, there was no questioning the logic behind Real Madrid's decision to pay Juventus €78m to sign Zinedine Zidane in 2001. He may have been approaching his 30s, but Zidane was still one of, if not the greatest technician playing the game. It didn't take him long to justify his signing, scoring a truly memorable left foot volley against Bayer Leverkusen as Los Blancos won the Champions League in his first season at the club. The record deserves to be Zidane's forever in a day, but it's likely that the fee will likely be usurped as money continues to fly around like wedding confetti. Speaking of throwing money around like confetti brings us nicely to the Chinese Super League, and specifically Brazilian midfielder Paulinho. The former Tottenham midfielder left north London in 2015 for around €14m - only for his valuation to somehow treble four years later when Guangzhou Evergrande decided they would have a second bite at the cherry signing him - this time bringing him back from Barcelona, where he spent just one season. When a conversation crops up discussing the greatest finishers to have ever played the game, the name Gabriel Batistuta often follows. The Argentine was one of the most complete forwards to ever grace Serie A, where he scored endless amounts of goals for Fiorentina and Roma. His loyalty to the Viola perhaps was one of his most admirable qualities, though it ultimately deprived Batistuta of winning the countless amount of trophies that his ability perhaps deserved. A €36m move to Roma eventually sealed the deal for Batistuta and earned him a well deserved Serie A crown - despite some at the time feeling that he had perhaps cost too much money. One expensive transfer that hasn't worked out too well is Tottenham's €13m acquisition of Fernando Llorente from Swansea. The Spaniard was brought to the club as an understudy to Harry Kane, but his move perhaps highlights best the amount of money being banded around for players who are perhaps not at their best anymore. A signing that won't go down in the annuls of time. Cristiano Ronaldo. Undoubtedly one of the greatest players to have ever played the game, for club and country. So good as it goes that Juventus decided to fork out an eye watering €117m last year to end his nine year stint at Real Madrid. You could say that Ronaldo's credentials warrant such a fee - with five Ballon d'Or's, five Champions League and five league (3 x Premier League, 2 x La Liga) crowns just a snippet of his accomplishments. Age would be a concern for most mere mortals - but ​Ronaldo, alongside Lionel Messi, have perhaps proven that they are actually from another footballing planet. One of the finer bits of business in recent years (in the selling club's case at least) saw Jose Fonte move from West Ham to Chinese Super League outfit Dalian Yifang for €6m. It wasn't such good business for Dalian as it turned out, with Fonte terminating his contract in China just five months after moving there. Still, while he was there, Fonte achieved some notoriety for enduring one of the worst debuts of recent times - as Dalian slumped to an 8-0 defeat in his first outing. There probably won't be another goalkeeper quite like former Paraguay international goalkeeper José Luis Chilavert. That can be said with some confidence because although many will try to imitate his free-kick and penalty taking exploits, there will be few who can replicate the trailblazing exploits of Chilavert. Few are likely to move for as much as €5m aged 35 either - but that's exactly what Chilavert did back in 2000 when he joined Strasbourg from Velez Sarsfield.